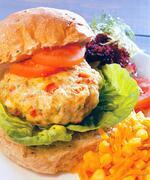 So, we're biting the bullet and kicking things off today with a recipe for Cheesy Chicken Burgers. They're really easy to put together and the white meat means that you don't have to quite admit your giving in to winter just yet! (though we'll have plenty of red meat recipes coming through the rest of the year, plus some veggie options too) So pop down to the supermarket, grab your ingredients and enjoy this quick and simple recipe. Preheat the grill. Heat 1 tablespoon sunflower oil in a frying pan and gently cook the onion and garlic for 5 minutes. Add the red pepper and cook for 5 minutes. Transfer into a mixing bowl and reserve. Add the chicken, yoghurt, breadcrumbs, herbs and cheese and season to taste with salt and pepper. Mix well. Divide the mixture equally into 6 and shape into burgers. Cover and chill in the refrigerator for at least 20 minutes. To make the sweetcorn and carrot relish, put all the ingredients in a small saucepan with 1 tablespoon of water and heat gently, stirring occasionally, until all the sugar has dissolved. Cover and cook over a low heat for 2 minutes, then uncover and cook for a further minute, or until the relish is thick. Place the burgers on a lightly oiled grill pan and grill under a medium heat for 8–10 minutes on each side, or until browned and completely cooked through. Warm the rolls if liked, then split in half and fill with the burgers, lettuce, sliced tomatoes and the prepared relish. Serve immediately with the salad leaves. This is just one tasty recipe from our popular title Meat Eats. 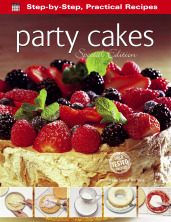 Packed with loads of tasty recipes that aren't too tricky to pull together. Take a closer look at the title by clicking here. To view it Amazon, click here.